Regular maintenance of your slurry pumps extends the wear life, helps avoid unplanned downtime and lowers the total ownership cost for end users. In the rigorous, demanding world of mining, slurry pumps are often run to breaking point before intervening. This may seem beneficial in the short-term, but in the long-term you could be doing your plant an injustice. Monitoring the performance characteristics of the pump regularly keeps you informed of its operation, and provides ample time to take a measured response rather than incurring a failure and unplanned downtime. From a preventative perspective, there are regular tasks to carry out during the campaign of the pump to ensure it runs for longer. If there is an unusual sound detected, leakage identified or a spike in temperature or vibration, this triggers the need for more in-depth maintenance during a planned shutdown before a failure occurs. Every machine that runs vibrates: place your hand on your refrigerator at home and you will feel minor vibrations as the motor runs. With most machines, vibration is one of the earliest indicators of a machine’s health, and is therefore an important measurement to monitor closely. The vibration velocity target varies from pump to pump; the maximum value target for a large pump will be greater than a medium sized pump handling water. Conversely, when introducing solids into the fluid, the vibration will increase in relation to the mixture properties and the duty parameters. When running routine inspections, Weir always refer to historical data to understand the range of vibration acceptable for that particular pump in that particular application. Vibration monitoring is about following a trend on a regular basis to understand if there has been a noticeable change. Weir’s technical customer facing team are familiar with the data and can tell you when the equipment is approaching the end of its life or if there is an issue there that needs to be attended to urgently. Once the pump reaches the end of its wear life, it is normal to experience an exponential growth curve in vibration readings, which will start to increase gradually. However, if Weir’s team notices a spike in vibration before the end of its service life, then something is wrong and requires further investigation. Generally, a spike in vibration is due to a wearing impeller or other wet end parts, which we can simply change out during a planned shutdown. The bearing assembly is a critical component in any rotating equipment. In general, the bearing assembly service life is dependent upon the process and operation. When selecting a bearing assembly in relation to the hydraulic performance the L10 bearing life is taken into consideration. An increase in vibration and noise level is a clear indication that there may be an issue with the bearing assembly. 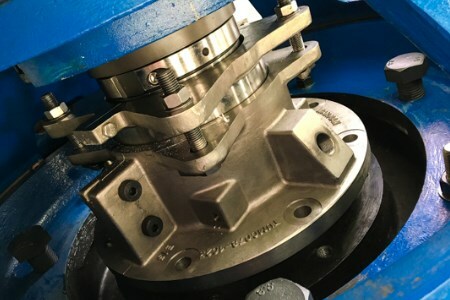 One of the main contributors to premature bearing failure is inadequate gland seal maintenance, which can cause leakage, spraying slurry and water directly onto the bearing assembly. This can be minimised by regularly adjusting the seal and applying correct and consistent lubrication. With Weir’s Warman® Accumin® lubricators, the company removes personnel from the process. Weir can set up an automated system which consistently lubricates the bearing and sealing system to reduce the potential for slurry ingress and maximise the life of the bearing assembly. Throatbush wear rate has a major impact on the overall efficiency of slurry pumps and in many applications has the shortest life compared to other components. The company’s team can spend an hour on each pump adjusting and fine tuning the throatbush to extend the life of the pump by up to 50%. This allows for the other components to be fully worn out at the same rate before they are changed out, enabling the operator to derive the maximum value in terms of cost per tonne from the overall rebuild cost. The importance of adjusting the throatbush to ensure the optimum gap between the impeller is vital. To help improve this process for operators, the company developed automated rotating and axial adjustment technology, speeding up the process and increasing the accuracy of axial movement. It is important to note that a drop in efficiency is not always an issue with the pump. An analysis of the operating parameters is needed, as well as an evaluation of the application to identify the root cause. Weir’s specialists are trained not only to look at the pump, but to also inspect upstream and downstream to understand if there is anything happening that may affect the pump’s operation. There are a number of reasons for the premature failure of hydraulic components. A common issue that we experience in the field is incorrect materials being used for the application. There are a myriad of different material combinations that an operator can use and it is important to use the OEM’s expertise in hydraulic design and material selection. Mine operators approach maintenance in different ways; some choose for their team to maintain the slurry pumps whilst others choose to use the service of the OEM to carry out all maintenance procedures. Weir takes a hands-on approach to maintenance, with its fitters and service engineers out in the field at least 50% of their time, helping customers inspect and rebuild their equipment. This regular contact with the customers and equipment onsite ensures its team is in tune with maintenance best practices, reports any deficiencies and ensures the pump can adapt to meet customers’ performance requirements. The company’s philosophy is preventative maintenance; regularly maintaining the pump to alert the customer ahead of time if there is an issue so that it can plan for it. Following a plant audit, Weir works with the customer to set up maintenance strategies that are bespoke and plant-dependent. It also offers a ‘fixed cost per tonne of throughput’ model to reduce the historical cost per tonne for maintenance in the plant for slurry pumps. Utilising its expertise, prediction models and product development, the company helps the customer save money and budget with confidence. Another option is predictive maintenance, using Synertrex® its IIoT solution. This technology allows operators to closely monitor the health and performance of their pumps and triggers an alert when an issue occurs. When installed on a Warman pump, Synertrex can monitor the bearings and gland seal health, detect cavitation and other hydraulic anomalies, track efficiency and forecast wear life, allowing operators to make condition-based decisions.